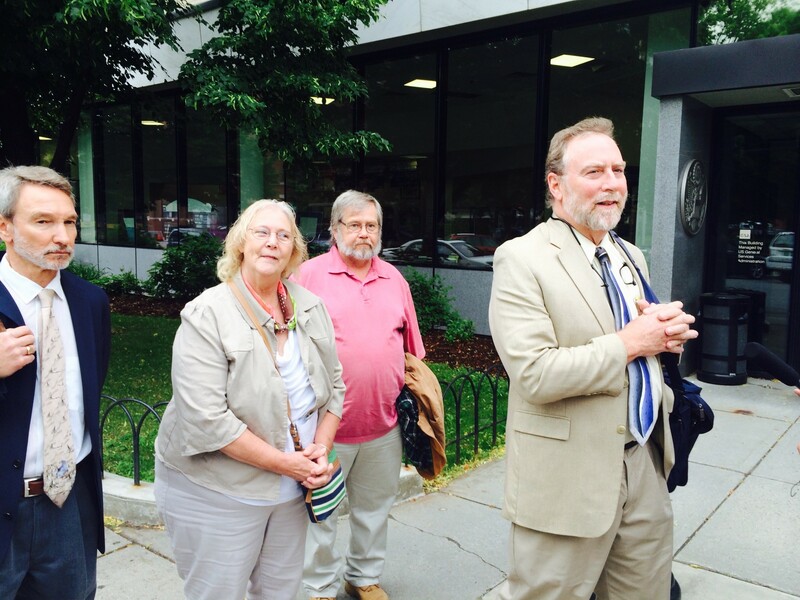 From left, Allen Gilbert, director of the Vermont chapter of the ACLU; Rhonda Taylor, her husband, Ken Taylor and attorney Robert Appel announce outside U.S. District Court in Burlington the filing of a wrongful death lawsuit against the Vermont State Police for the 2012 death of Rhonda Taylor's son, MacAdam Mason. The mother of a Thetford man who died in 2012 after a Vermont State Police Trooper shot him with a stun gun has filed a federal lawsuit accusing the trooper of using excessive force and ignoring protocols. In a 34-page lawsuit, Rhonda Taylor alleges a trooper who responded to the home of her son, MacAdam Mason, to check on his medical condition never should have fired a Taser into his chest. State law enforcement officials cleared Trooper David Shaffer of wrongdoing, returned him to active duty and released little information about the incident to the public. "This is a very sad day, not only for Rhonda, but for the state of Vermont," her attorney, Robert Appel, said during a press conference this morning outside U.S. District Court in Burlington. "This is the only way people can hold police accountable. Left to their own devices, supervisory law enforcement officials have not done well in holding accountable the police when they break the law or protocols. It's important that these cases be filed so that people know how the police work and fail to work in a lawful way." The suit, which seeks unspecified damages, was filed one day before the statute of limitations expired. The two-year anniversary of MacAdam's death is tomorrow. Vermont State Police spokeswoman Stephanie Dasaro could not be reached immediately for comment. Vermont State Police responded to a call at the home Mason, 39, shared with his girlfriend after he had called a local hospital and threatened to harm himself and others. The hospital asked police to conduct a "welfare check." After suffering a brain seizure the night before, Mason was in an agitated and irrational state that doctors say is common among such patients. His girlfriend, Theresa Davidonis, says she relayed that information to troopers and pleaded with them to allow Mason to calm down. Instead, a confrontation ensued. Shaffer ordered Mason to lie down on the ground. Police say Mason began moving toward the trooper in a threatening manner with a closed fist. The trooper fired his Taser, striking Mason in the chest. He died of cardiac arrest. Davidonis' son has said that Mason had raised his hands in surrender and was not a threat to police. Shaffer had trained in Taser use only a few months before the incident, the suit says. It alleges he ignored training by shooting Mason in the chest. Shaffer and other troopers who responded to the scene are named as defendants, along with Public Safety Commissioner Keith Flynn and Vermont State Police Commander Col. Tom L'Esperance. Attorney General Bill Sorrell cleared Shaffer of criminal wrongdoing, saying the trooper was justified in firing the stun gun. In response to the case, lawmakers passed a bill this year mandating increased training for police officers using Tasers, and tightening criteria for firing the weapons, which can emit about 50,000 volts of electricity to temporarily incapacitate a person. Taylor and Appel said the law was a good start, but not enough: Appel criticized Sorrell for what he said was "a record of not bringing charges against police when they engage in misconduct, including excessive force." He also noted that the standard for proving liability in a civil case is easier to meet than the standard of guilt in a criminal case. Mason has a young daughter from a prior relationship. Taylor said she hoped in part to be able to pay for the child's college from money recovered in the lawsuit. But Taylor said her primary motivation for filing the suit was to bring attention to what happened. "Nothing will bring him back," said Taylor, of New Hampshire. "We live with that every day. But I'm hoping this will make a difference for others." Claims against police are notoriously difficult to prove. Police are often granted legal immunity for actions they take in the line of duty, and are given wide legal latitude in responding to fast-moving situations. Moreover, Taylor is still bogged down in a legal fight in a Vermont probate court. The woman with whom Mason had a daughter has asserted that she, and not Taylor, is the lawful executor of Mason's estate. Only the executor has standing to file a suit. Allen Gilbert, head of the state chapter of the American Civil Liberties Union, which has sparred with police for years in efforts to seek more transparency for police actions, joined the press conference. "Police have an interest in police accountability too," Gilbert said. "The best weapon police have in doing their jobs is public trust."